There’s never a convenient time for your child or you to get sick. While missed school (and work!) days are going to happen, there are steps to can take to minimize them through some natural steps which will prepare your family for cold season. As a pediatrician and a parent, I’m eager to share strategies to support your immune system so everyone will be less likely to get sick in the first place. I’m also including simple ways to address your child’s cough and cold symptoms that don’t involve medication. Taking a natural approach to preventing illness this time of year is also important to note because all bottles of cold and cough meds that have dosing labels for kids under 2 have been taken off the shelves and are no longer available. Manufacturers have also just declared that these meds should not be used in children under 4 years of age. For coughs, running noses and congestion, give your child steam, steam, and more steam. For infants and young children, turn the bathroom into a steam room with the door closed and the shower on full hot. Sit in there for 10 or 15 minutes. For older children, use a facial steamer or pot of hot water (carefully!). The steam will help loosen the nose and chest congestion, and help your child cough it up or blow it out. Do this steam cleaning every morning and before bed, as well as during the day if possible. Clap the chest and back. While you sit in the bathroom steaming, clap on your child’s chest and back (where the lungs are) firmly (harder than burping) with an open hand. This helps shake the mucus loose so your child can cough it up better. If possible, encourage your child to sleep in a slightly upright position. This allows for easier breathing during sleep. 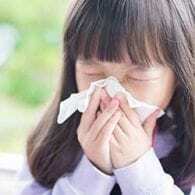 For older children, it is crucial to have them blow their nose several times during a steam cleaning, as well as frequently throughout the day. Getting out all the junk will help prevent this from turning into a bacterial infection. An alternative to steaming is to use a nasal decongestant spray to loosen up the nasal congestion before blowing it out. For infants too young to blow their nose, you can suction them out using a blue rubber bulb syringe. This will help to thin secretions and prevent dehydration.